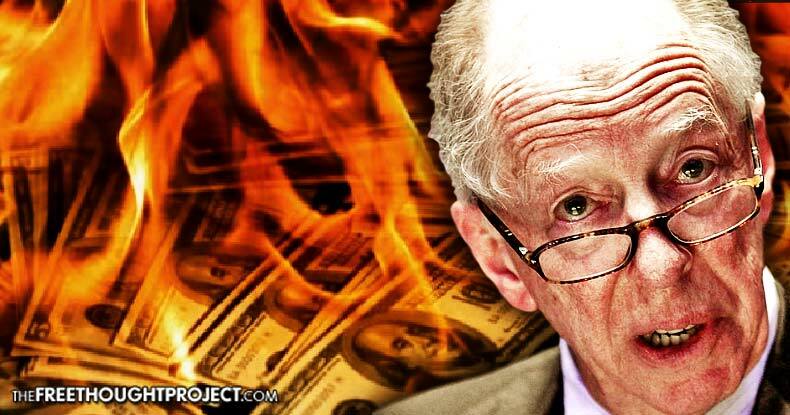 Rothschild Makes Dismal Admission — His Financial World Order Now "Threatened"
RIT Capital Partners fund issued its 2016 year-end report in late February. While the company was pleased to report a net profit of 12.1 percent and total shareholder returns hold at 14.2 percent, the company, and its chairman Lord Jacob Rothschild, seem preoccupied with risks associated with political and economic instability. Rothschild announced that while the funds’ assets are at an all-time high, the announcement comes, “Against a background of daunting uncertainty and political turmoil.” Going further, he stated a more ominous warning. “At this time of upheaval and uncertainty, our investment portfolio will continue to be well diversified,” he wrote comforting his shareholders their fund’s portfolio would be as protected as possible from any coming downturns in the market. However comforting the report may be for individual investors, Rothschild’s final comments loom large over the mostly positive economic report. He wrote, “There could well be a period ahead of us when the avoidance of risk is as high a priority as the pursuit of gain.” The investment banker’s chosen word of “period” seems to indicate a coming downturn in profitability, even though for the past five years the fund has realized a profit of more than 1 billion Euros. If the fund, whose value is at an all-time high, suddenly declines, falling with it will be a large portion of wealth the Rothschild family enjoys. Although, any such declines would hardly come as a surprise to the Rothschild family who reportedly controls much of the world’s wealth and has a hand in nearly all of the world’s banking institutions, including the Federal Reserve, as some have stated. The chairman’s statement continues with what some might say is an ominous and uncertain view of the future. “Since the last World War, we have enjoyed some 70 years of patiently crafted international cooperation, which is now threatened,” an apparent reference to Brexit and the UK’s referendum to withdraw from the European Union. “Against this deeply worrying geo-political situation,” he wrote seeming to highlight the potential of WWIII if the Syrian conflict continues, “one can point to a number of positive investment factors.” Echoing many statements made by the current U.S. president, Lord Rothschild stated he was hopeful corporations would receive a break in government imposed revenue. He said, “in the US, the proposed tax reduction for companies and individuals,” was a favorable policy change for his fund’s portfolio. Resounding President Trump’s call for deregulation, Rothschild also was reportedly pleased with the “reforms of an over-regulated system.” Likewise, in step with Trump’s call to exponentially increase spending on America’s failing transportation infrastructure, Lord Rothschild is pleased. However, Trump’s call for, “increases in fiscal and infrastructure expenditure…come at a time late in the business cycle, when the labour market is close to full employment,” meaning there’s no forecast of immediate returns on infrastructure spending forecasted in the future. The banking and financial baron also seemed to lament that “wage increases up by some 4% over the last few months” a factor which affects the bottom line for every company. He also stated across the fund’s portfolio will also be affected by rising interest rates. “Valuations are at the high end of their historical range, inflation is returning and in these circumstances, it is likely that interest rates in the US will rise meaningfully,” he said. And coming from the man whose familial connections and financial partners control the Federal Reserve, he should know.